A moderately strong Monsoon current will cover Mumbai region from Monday. An off shore low, embedded in the trough will precipitate rains starting from Monday. Day will be overcast with some drenching showers. Rain/Thunder frequency increasing by night.Good Chance of a Thunderstorm. High: 31c. Real feel temperature will be 35c.Rain quantum (day and night) around 35-40mms. Day will have frequent spells of heavy rains/thunder, with chances of flooding and water logging. A typical monsoon day with gusty winds. High will be 29c, and real feel temperature around 30c.Rain quantum (day and night) about 90- 100mms. Heavy rains will continue with occasional thunder and strong off shore winds. Water logging possible in the pre noon hours. Rain intensity might taper off after night. Rain quantum during the day about 65mms and 35mms during the night. Thank you for the detailed forecast. 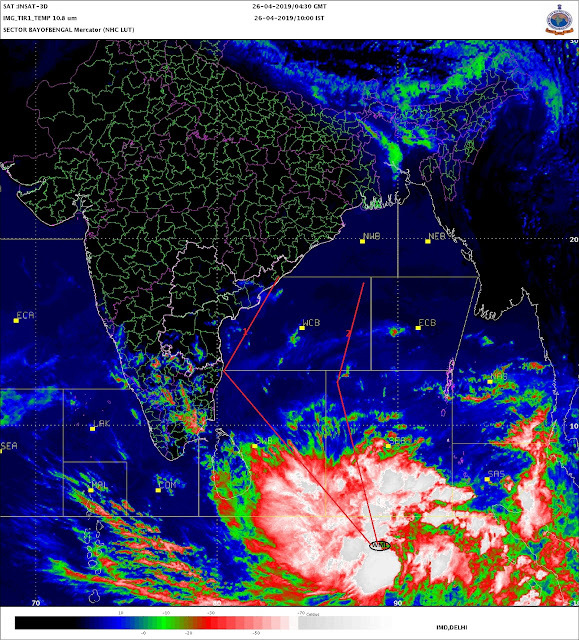 I must say your forecasts and analysis is really good as compared to what our IMD has to offer. Keeps the readers well informed. I had one question which I have kept pondering over. Why do we have thunderstorms at the onset and withdrawal times of the Monsoon in Mumbai? Once the Monsoon is set (June end - August end) we very rarely have rains with thunder and lightning in Mumbai. I was reading a blog on Monsoon and it says 'Monsoon rains are always convective'. Anonymous, ur query reg. thunder activity at start and withdrawal of monsoon, reason is that this activity takes place when cold air and hot air meets. i.e the advancing monsoon brings cold air and it meets the hot air rising from the over heated land mass on its frontline. Same repeats during the withdrawal at the receding border. emkay, your analysis is convincing. Also, most of the times, in the mid monsoon period, the winds are south-west and low level clouds are moving inland. Strong winds and low temperatures do not permit the clouds to rise high.As also there are no thermals to lift the cloud top.